Some brides-to-be DREAM of wearing their Mom’s wedding dress on their special day. It keeps tradition, has sentimental value and (with some alterations if needed) it can also save money. However, as a future bride-to-be, I loved the idea of wearing my mother’s dress, but it would not suit my wedding at all. Luckily for me, my mom and I wear the same size shoe…and she just happened to have saved her cute little kitten heel wedding pumps from her special day. I tried them on and it was an instant fit. 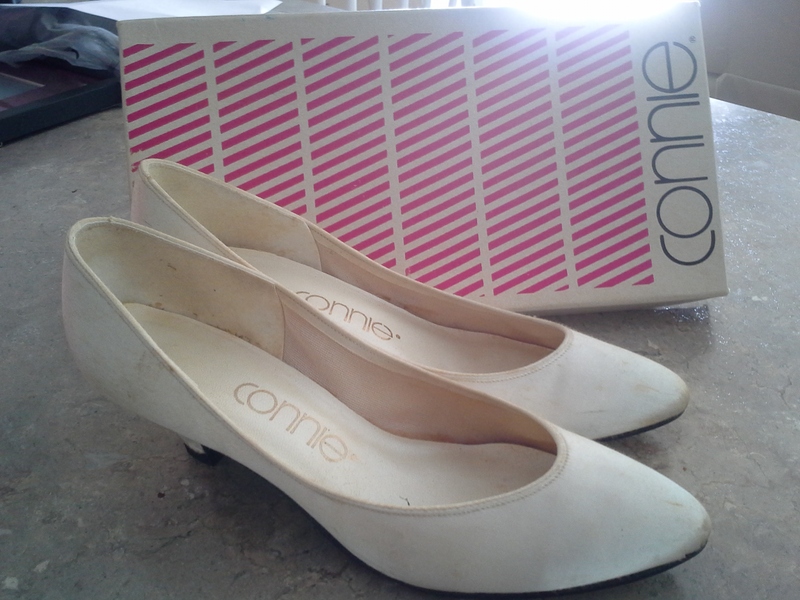 Only problem was…the shoes were a bit dirty and the heel tips were worn. (After being in a box for 25 year, they went from white to a cream colour). Plus, I wanted a bit more of myself in the shoes I wore…they needed some *Sparkle*. So, I got the heel tips replaces for $9 at a local shoe store then I went to Pinterest and started searching…and I found it! And they seemed easy enough to make…so I went to my craft store and bought all my materials. – Sand Paper, Painters Tape, Brushes, Aluminum Foil. First thing you want to do is prep your shoes. 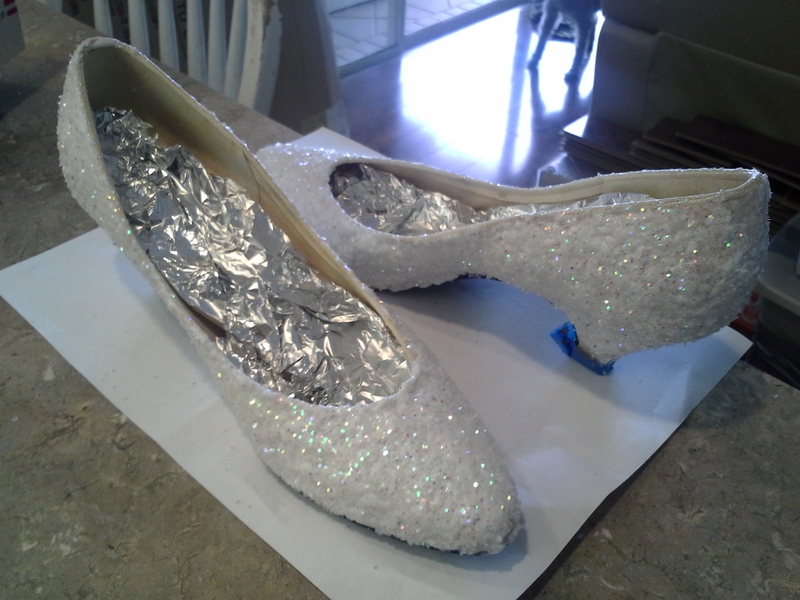 Cover the heel tips with tape and stick some foil inside of them to avoid getting the Mod Podge all on the inside. 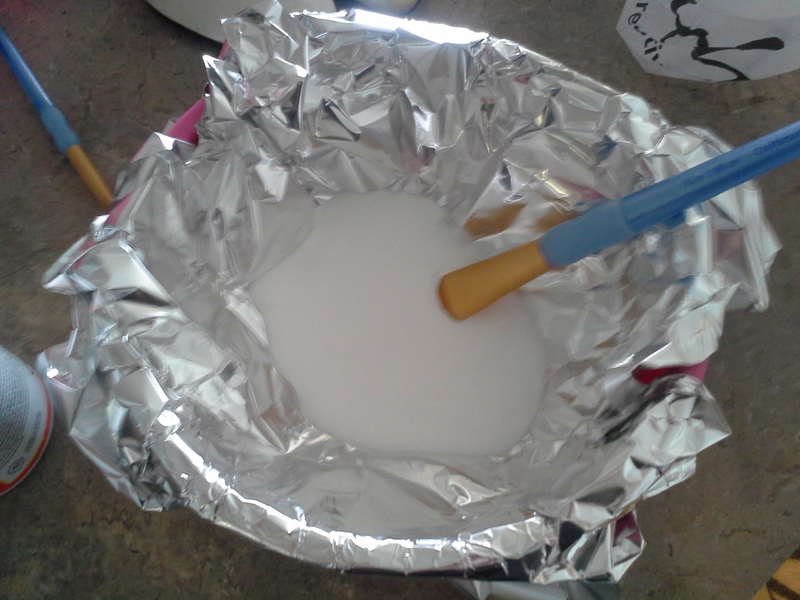 Stick some foil into a bowl (don’t want to mess up your bowl), pour in some Mod Podge, then add your glitter! Now, I would buy more glitter than you think you will need…I ran out after the first two coats. Avoid the extra trip to the craft store…. Start painting those shoes! Try not to do too clumpy of the mix, makes the shoes dry funny. Try to keep the mix even when you brush it on. Leave 15 minutes of dry time between coats. Since I did iridescent glitter, I had to do about FOUR coats to make it really sparkle. I even added extra glitter after brushing on the final coat. I made it rain glitter all over those shoes. Leave the final coat to dry. I let mine sit for an hour. After that, take those shoes outside and spray them with the acrylic sealer. This makes the glitter stay put and keeps your shoes shiny. Do two coats, 10 minute dry time in between. Once you’ve done that just leave them someone at room temperature for 24 hours or so…then BAM! You have some awesome wedding shoes. For those brides on a strict budget…These shoes only cost me $20.23! So, if your mom still has her shoes from her wedding, change-up tradition. Keep the sentimental value and specialness of wearing something of your Mom’s while also having the wedding dress of your dreams that suits both you and your wedding perfectly.